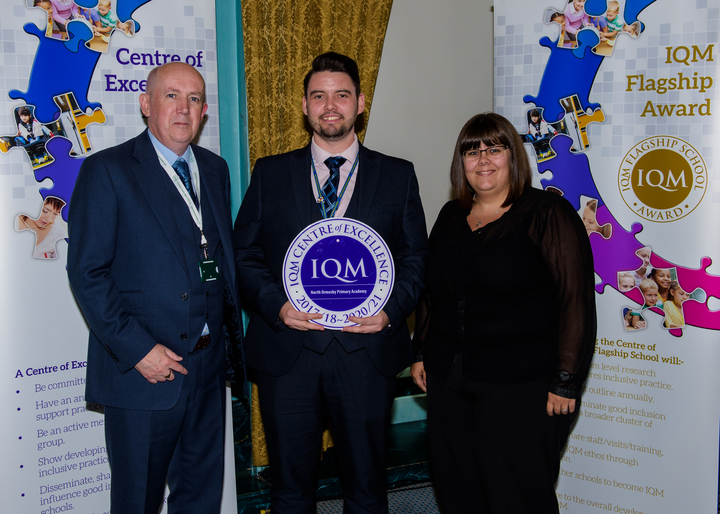 North Ormesby Primary Academy in Middlesbrough has achieved Centre of Excellence status. The school works tirelessly to live up to their promise that inclusion is for everyone. ‘Everyone is special, everyone is different’. Labels are left at the door in this oasis of learning. Children are at the heart of every decision made. They are immensely proud to be here, to be consulted and listened to with regards to every aspect of their provision. The integrity of leadership gives a strong moral purpose and inspires everyone to share the vision and the belief that every child has the potential to be the best they can be and be well prepared to meet the future. Staff matched pupils in their boundless energy and passion for learning. The outcomes of this energy can be seen in the brain friendly enriched classroom environments; spaces which value pupils’ creativity and encourage them to feel a sense of comfort and belonging. The assessor was drawn in to jungles and space centres, caves and crime scenes, boats and cosy beds. Pupils work purposefully on bean bags or soft sofas, in reading lofts or at horseshoe tables and carrel desks; how they prefer to learn is how they are able to learn and they do so cooperatively and calmly. They are polite, well-rounded individuals who demonstrate tolerance and respect. The best work from all classes is displayed beautifully in corridors, confirming that the high standards expected of pupils is reached. Wall murals, such as the colourful history timeline are vibrant teaching aids to support learning, other decorative affirmations remind children of what they can achieve and aspire to be. The magic then weaves its spell on enriching oracy, problem solving, collaboration, team building, cooperation and empathy. A strong focus is given to developing the necessary life skills which will hold them in good stead in the future. TIM, the school mascot, is visible everywhere as a non-threatening reminder of how a model pupil should behave in order to thrive and succeed in school. This combined with strong staff role models encourages children to be their very best. The school caters for pupils’ personal development by providing unique opportunities to develop leadership traits and enable positive contributions. There are remarkable things happening for all pupils at all ages. There are Mini Police, Sports Leaders, Learning Leaders, Eco Warriors, Digital Ambassadors, Young Interpreters and a School Council. Pupils spoke articulately and with pride about their roles, embracing responsibility and wanting to step up to make a difference within the school they love. They understand that when they give of their best and make positive contributions they reap the rewards. Ofsted, who graded the school as ‘outstanding’ in 2015, described pupils as being ‘intrinsically motivated’ and it is evident that the ethos of trust, the exciting learning opportunities and high aspirations enable all learners to achieve and flourish. In keeping with the philosophy that everyone is a learner, every exciting opportunity has been carefully researched to benefit the social, emotional, physical and academic needs of all learners before implementation. The Headteacher is committed to ensuring staff have the skills needed to meet the needs of pupils and the community. Staff are passionate about learning, being lead learners themselves, it is a highly reflective and self-evaluative school. They are keen to network and collaborate, share skills and learn from one another. Strong leadership ensures that staff are nurtured and skills are captured. They both seek and give support for the benefit of children. North Ormesby is a regional training centre for Apple which brings unlimited possibilities for pupils, staff and the wider community. Technology has been embraced not only for its potential to provide bespoke and differentiated learning pathways but also because of its power to motivate, engage and be future ready. As barriers to learning are removed, pupils grow in self-confidence and maturity, leading to the positive behaviours, skills and talents demonstrated by pupils of all ages and levels. Throughout school there are displays of the incredibly professional finish pupils achieve through the skills they have developed. An example of this is the inspirational colour photography based on the book ‘When I coloured the world’. Good use is made of specialist providers in the arts, sport and music to give universal access to a high-quality curriculum and to promote wider opportunities for life-long learning. A further strength of the school is how leaders have pastoral and/or academic roles and responsibilities which place the needs of vulnerable learners and their families at the heart of all they do. The Headteacher describes this as having ‘The aces in the places’ and is another example of the magic weaved. Highly effective assessment and tracking systems which make use of all available data is at the centre of this. Safeguarding and Inclusion is led by a committed practitioner who is dedicated to her work with children and families and has ensured that the strong safeguarding policies and procedures are implemented consistently and are relentlessly monitored for maximum impact. She has developed valuable partnerships with a wide range of supportive agencies to ensure that needs are met and safety nets are in place. There is exceptional support for children with SEND for example for children with Speech and Language needs, where high quality teaching and external support enables children to make impressive progress. Children with specific learning needs also receive high quality provision within school and through the involvement with specialists. Vulnerable learners have their own champion so that any gaps which appear can be identified swiftly and actions implemented. This is a driving force for the nurturing and innovative curriculum choices offered throughout which makes this school stand out from the rest. A skilled Business Manager supports this team to evaluate provisions and initiatives for impact and value for money. The Governing Body has helped create the culture of risk taking and is very well informed about how the school is performing. Staff say they feel valued and are constantly motivated to share the same commitment as the Headteacher towards learning, collaboration, supporting others, consultation and engaging in open communication. “They have been brilliant in making sure whatever happens never impacts negatively on the learning for our children”. Parents praised the school’s efforts to communicate with them through a variety of means such as website, Twitter, Blogs, Marvellous Me and regular face to face contact. Popular INSPIRE open learning days give regular opportunities for them to engage in what their child does in school and to be supported to help them further. They recognise the fantastic effort which goes into the inspirational curriculum and innovative environments and see first-hand how it motivates children to succeed. The school has built up an impressive range of networks and community links which help prepare pupils for their place in the future and become part of a more diverse community. A particularly valuable relationship has developed between the local constabulary and the school both as a means of breaking down barriers between police and young people and to give meaningful opportunities for making positive contributions within the community. Liaison Officers praised the Head, staff and pupils for the way in which they have formed strong partnerships and the way in which their initiatives have been welcomed in school. These links help provide pupils with skills, knowledge and understanding for example about keeping safe, anti-bullying, internet safety and fundamental British values, and to act as ambassadors for the school at local events, parades and celebrations. The Self Evaluation Report gave clarity to the myriad of ways in which inclusive practice is implemented and the visit was enlightening in demonstrating what it is like to be a child in this joyful school.